Effective visual marketing requires a special understanding of the many overlapping skill sets and functional areas that need to come together to produce an attractive trade show booth design to support your company’s branding. Identifying and properly executing these elements across a central brand message is paramount to the success of an exhibition. When your sales team goes to battle on convention day, make sure everyone has the ammunition to succeed. Weston Joslyn of Monster Displays offers these guidelines that serve as your "graphic design boot camp." One of the quickest ways to drive away your potential clients relates to having unattractive imagery, as part of your trade show display design. Grainy, low resolution graphics on your banners and displays sends a clear message: you aren’t prepared. When your presentation lacks a "wow factor," there is instant subliminal association of unprofessionalism and even faulty products. That old adage holds true: perception is reality. For your trade show display design, you want a clever headline with eye-catching imagery, however keep in mind that communication is critical. Catching someone’s attention versus making a lasting impression that attracts them toward your booth are two different strategies. Yes, the presentation style you choose should have an appealing, complimentary color scheme. More importantly, maintain consistency with your company’s branding. When your customer has a need, you want them to think of you- so make sure they’re not mistakenly reminded of your competitor. Does your layout promote an organic Z-pattern the human eye uses to process information? Does your tagline or savvy marketing verbiage make references that a broad audience will miss? In the end, if you haven’t communicated something memorable to your audience you might as well put on a silly costume and start waving a sign at the nearest intersection! If you are not able to cut through the "noise," it will not matter if you spent a month designing your banners, or just a few minutes. Remember to try to stand out through uniqueness and integrating best practices in your design. If your idea of capturing attention is to overwhelm, you can count on being overlooked. According to Joslyn, every client has different expectations and you are not likely to always agree unless goals and objectives are clearly defined. When the “internal customer” relationship is not respected and empowered to succeed with tasks in the chain of a project, the “external customer” undoubtedly suffers and expectations and trust in your team may begin to drop off. When it comes to managing a project process from the concept through finished exhibit booth, proper communication within your organization is key to avoiding missed deadlines, unnecessary rework and inconsistency within your marketing collateral. In the case of trade show events, there are many other elements that depend on the selling appeal of the graphic presentation. If lacking communication between departments has weakened the impact and quality of your visuals, or worst of all, the concrete event deadline is not met, the result can be costly to both customer confidence and the budget. Having an integrated trade show display design process allows all the pieces of your value proposition to be projected to your customers in a synergetic manner. The idea of vertically integrating your brand message is by no means a new one. This concept has only grown with the advent of new media, where marketers now have more range of platforms on which to broadcast their messag... from as old school as traditional newspaper ads to the latest trending social media viral campaigns. Now that opportunities to get your brand's message in front of consumers have grown, there can be a huge separation between the various positioning statements that your audience is seeing. Getting your marketing boat to row in the same direction may take effort, mindfulness and strategy if your company is a solo act or even small business. However this concern is multiplied even more when you are working as part of a medium or enterprise level company. Imagine that you work for a company with three different marketing divisions tasked with focusing on billboards, social media, or magazine ads. It becomes increasingly difficult and important to ensure that the brand's current message is pushing the right product focus to achieve your brand's overall big outcomes identified by the top decision makers. You might say "hey, there's no chance every person is going to see all of the ads we are putting out. Why not push a few different messages?" The rationale of this shotgun approach might not be wrong, but it is flawed. From an aerial view, your brand might start to look confusing and ever-changing, taking on more than one personality at a time. In a world where brands embody the confidence people have in your products, this effort might weaken the message of other marketing teams. Eventually you are casting doubt in your consumer's eyes whether or not they can trust your company, possibly making them wonder if you are going out of business or that an agency war for creative control is being waged. Some of this relates to expectations: do what you say, and in turn your marketing should say what you do. If McDonalds is touting the return of the McRib sandwich on the radio, and when you get to the drive-through window all the promotional signage says "try our new fish sandwich" – and no one taking your order has heard of the McRib – you are going to be confused, if not a little angry. You'll also quickly wonder just what in the world is going on with McDonalds! Now this is an exaggerated example, but you can imagine how this kind of inconsistency can begin to cast doubt on your brand. Joslyn explains that this concept is one part understanding human psychology and one part writing to motivate an action in your reader. People naturally process information in a logical way. Despite how amazing our brains are at multitasking, we aren't as good at absorbing lots of new information at once. Unless you have near-photographic memory, most of us read a billboard and then when asked what it said we can usually only remember a few select things from that messaging. This is where you, the marketing content writer wants to put yourself in the shoes, or rather the eyes of the audience. Marketing copy needs to be brief and clear. For example, when you’re driving 70mph down the highway how much time do you have to look at a billboard? Ask yourself what you remembered most during those 4-7 seconds; now what about 30 minutes later? Keep in mind that trade shows are a melting pot of brand designs all competing for attention. Convention visitors have anywhere from dozens to hundreds of brands to absorb as they pass by, so remember to keep details within a takeaway brochure and stick to bullet points. 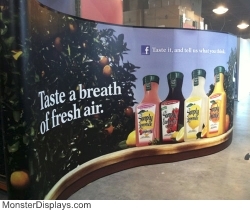 Everything about your trade show display design should be to the point and memorable. Brand Promise – Just as it sounds, your brand’s promise should be compelling and convey a benefit to buyers while being real and believable. In itself the “promise” IS what the brand represents; utilizing its logo, products and mission to build confidence. It is an expectation customers have, and most importantly the company should stand by their promise every time or risk damaging how the audience views their brand. Value Description – Each of these points logically underlines the previous “brand statement.” The proposed value should be reinforced by propositions are often broad and loaded statements. The description is an opportunity to add detail and therefor more legitimacy to the neatly packaged proposition. This usually comes in three supporting statements. There is quite a bit more to learn about graphic design production (a career’s worth in fact). Your marketing visuals are a make-or-break crux of your trade show exhibition, and these elements are only the beginning on your path to success. Keep these principles in mind; they will be your building blocks as you charge into the world of exhibiting.